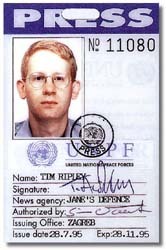 Tim Ripley covered the wars in the former Yugoslavia from 1992 to 1995 for Jane’s Intelligence Review and Flight International. 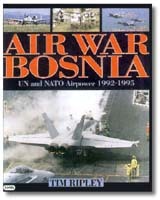 He is author of Air War Bosnia (Airlife Publishing, 1996) and a research associate at Lancaster University’s Centre for Defence and International Security Studies (CDISS). “The seed for this book was sown during some 21 visits to Bosnia, Croatia and Italy between 1992 and 1995” says Tim. “I spent several months in 1994 and 1995 with UN forces in Bosnia and Croatia, at NATO bases in Italy and on US aircraft carriers in Adriatic, witnessing many of the events recounted in this study.